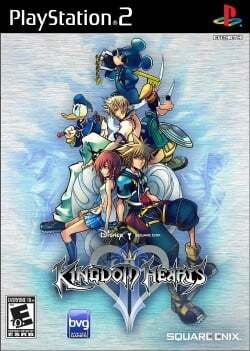 Game description: Kingdom Hearts II is the sequel to the action role-playing game, Kingdom Hearts, featuring a host of familiar characters from movies and video games alike. Disney characters Sora, Donald Duck, and Goofy are searching for their missing king, and it is up to you to help find him. The game also features characters such as Captain Jack Sparrow from Pirates of the Caribbean and characters from the Final Fantasy series of games. Voice actors Haley Joel Osment and James Woods join the cast, and the veteran designers of the original Kingdom Hearts have returned to work on the sequel. Description: Lights, specifically sun lights, can be seen through walls or different objects. Workaround: Has been resolved in recent v1.5.0 git builds. For older versions, switch to Software mode by going to Config > Video (GS) > Plugin Settings, and setting Renderer to any of the "(Software)" options. Description: Character has lines following them on the ground. Workaround: Has been resolved in recent v1.5.0 git builds. For older versions, go to Config > Video (GS) > Plugin Settings, turn on "Enable HW Hacks", go to Configure Hacks, and set MSAA back to "0x" (the default setting). This page was last edited on 16 April 2019, at 08:28.